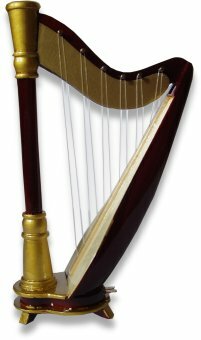 A miniature harp beautifully made from wood. 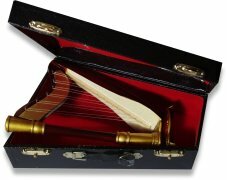 This miniature harp is crafted from wood and even comes complete with its own miniature velvet lined hard case. A fantastic music gift for the harpist or classical music lover. Approx Size :80 x 50mm (3" x 2"). PLEASE NOTE! This item is NOT fitted with a music box movement and is NOT a real instrument, only an ornament!, it does not play. 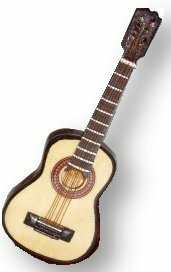 A miniature imitation guitar fitted with a musical movement. A miniature wooden electric guitar.